If Jesus was born today, where would it be ... ? 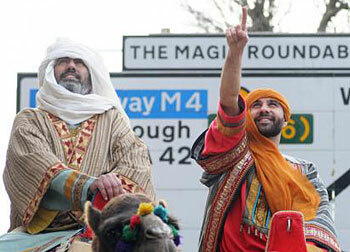 This Christmas Bible Society asked people 'Where would Jesus be born today?' Nearly one-third think it would be in the Yorkshire Dales. And the most popular choice for a Wise Man is Professor Brian Cox. The poll, carried out for Bible Society by One Poll, found London is the second most popular location for Jesus' birth (23%). Swindon, the Society's home town, comes last with only two per cent of people believing he would be born there. This makes it as likely a candidate as Bethlehem: a town which also wasn’t top of the list for an anticipated royal birth. Where would he be born? People were then questioned about what kind of place Jesus would be born in today. One-third (31%) chose a garden shed. 17% chose a Premier Inn/Travelodge. The least popular venue was a bus stop – which came just below the Hilton. As for the choice of the three kings – Professor Brian Cox topped the poll with one-third of people saying they would choose him as a Wise Man; followed by Sir Trevor Macdonald (16%). The Chancellor, George Osborne, came last, with just 2.5%. Joey Essex (3%) and the Archbishop of Canterbury, Justin Welby (8%) were also near the bottom of the list. When people were also questioned about which Nativity character they would want to play, angels came top. Interestingly, there was a large gender split. 40% of women wanted to be an angel versus only eight percent of men – even though every angelic name in the Bible is masculine. Overall Herod and Joseph were the least popular choices. A gift fit for a king? When asked what they would give Jesus as a present today, the most popular choice was a chocolate orange (13.7%) followed by socks (10.8%). 6% chose a Playstation 4, the same as an iTunes voucher or a football shirt – all coming ahead of the Xbox One. The least popular option was a Furby Boom – ironically predicted to be the number one top toy this Christmas. Head of Campaigns, Advocacy and Media, Matthew Van Duyvenbode said: "This poll is a bit of good fun, but it also points to a story of enduring significance. At the heart of Christmas is the message that God cares about the everyday, the ordinary and the seemingly insignificant. By encouraging people to think about the Nativity in terms of today’s ordinary experiences, we hope that they’ll revisit one of the world’s best known stories with a fresh perspective." One Poll surveyed 1000 adults across the UK. A garden shed in the Yorkshire Dales could be your best bet. This Christmas we've asked people 'Where would Jesus be born today?' Nearly one-third think it would be in the Yorkshire Dales. And the most popular choice for a Wise Man is Professor Brian Cox. The poll, carried out for Bible Society by One Poll, found London is the second most popular location for Jesus' birth (23%). Swindon, our home town, comes last with only two per cent of people believing he would be born there. This makes it as likely a candidate as Bethlehem: a town which also wasn’t top of the list for an anticipated royal birth.